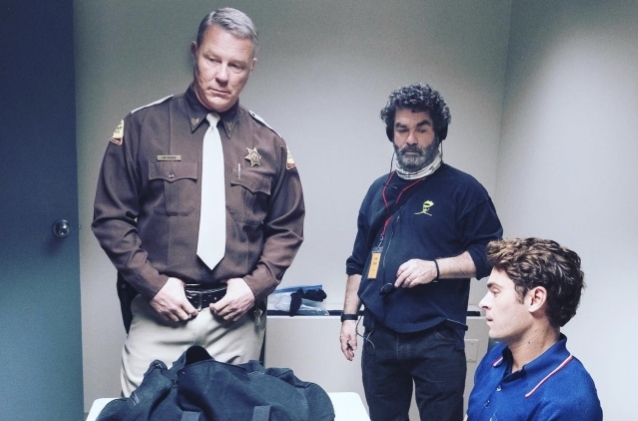 According to Variety, Netflix is nearing deal for U.S. rights and some international territories for the thriller "Extremely Wicked, Shockingly Evil And Vile", in which METALLICA frontman James Hetfield makes his dramatic acting debut. The deal cost about $8 million. "Extremely Wicked, Shockingly Evil And Vile" follows the relationship between notorious serial killer Ted Bundy, played by Zac Efron, and his longtime girlfriend, played by Lily Collins, who at the time had no knowledge of the crimes. The official trailer for "Extremely Wicked, Shockingly Evil And Vile" can be seen below. The Grammy and multi-platinum- and gold-award-winning artist plays officer Bob Hayward, a no-nonsense Utah highway patrol veteran who was the first law enforcement officer to arrest Bundy in 1975 after pulling the killer over and discovering burglary tools in his car but wisely suspecting much worse. While Hetfield has played himself in other films and television productions, this is his first dramatic role taking on a different character. Academy Award nominee Joe Berlinger ("Paradise Lost") directed. Hetfield and Berlinger have crossed paths before when the latter directed and produced the seminal rock-doc "Metallica: Some Kind Of Monster" along with the late Bruce Sinofsky. Berlinger also penned a book about his experiences with the band, "Metallica: This Monster Lives". "Having spent hundreds of hours behind the scenes with James and the rest of METALLICA, I have experienced his charisma and powerful presence close up," says Berlinger. "It seemed only natural that he would bring that same power and magnetism to a dramatic role, so when he agreed to my pitch that he be in the movie, I was thrilled." The original screenplay, written by Michael Werwie, won the Nicholl Fellowship first prize and was featured on the Black List. Golden Globe and multiple Emmy Award winner Jim Parsons and Academy Award nominees Haley Joel Osment and John Malkovich are also part of the cast along with Kaya Scodelario, Angela Sarafyan, Jeffrey Donovan, Terry Kinney and Dylan Baker. Efron appeared in James Franco's critically acclaimed comedy "The Disaster Artist" as well as "The Greatest Showman", "Baywatch", "Neighbors" and "Neighbors 2". "It's very interesting. I think the movie itself is really deep," said Efron to ET last March. "It doesn't really glorify Ted Bundy. He wasn't a person to be glorified. It simply tells a story and sort of how the world was able to be charmed over by this guy who was notoriously evil and the vexing position that so many people were put in, the world was put in." He added: "It was fun to go and experiment in that realm of reality. I didn't go full method and I didn't have to like do any weird stuff to anybody to get into character." Collins starred in the critically acclaimed dramas "To The Bone" and "Okja", the latter of which was nominated for the Palme d'Or at the 2017 Cannes Film Festival. Collins was also nominated for a Golden Globe for Best Actress (Comedy) for her starring role in "Rules Don't Apply". She appears in the mini-series "Les Miserables". The project was announced by Voltage Pictures at Cannes 2017.